Thank you to Janet for hosting our meeting. The hors d'oeuvres and blueberry pie were great. Especially appreciated was the service! Maybe your server would like a contract for future meetings Janet?? Linda, Shirley, Joan, Jolene, Michèle and of course Janet attended the meeting. Each year at the January meeting, the Book Club gives out it's Academy Award to the member who recommended the book read in the previous calendar year that was most enjoyed by the members. City of Joy, recommended by Linda won this year. Congratulations Linda! Jolene bought a book as prize. There was also a runner-up prize but since no other book received more than one vote, we decided to save the runner-up prize for next year. 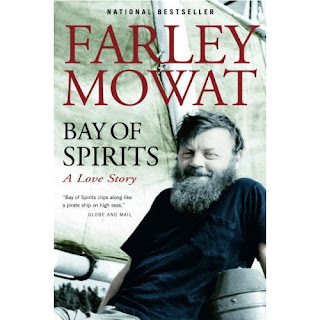 This meeting's book was Bay of Spirits by Farley Mowat. A Canadian born in Ontario, Mr. Mowat lived many years in the out posts of Newfoundland. He is well known for his books on wildlife and many of his books were written for children. He is a somewhat controversial author because of his views that he has clearly articulated on subjects such as the baby seal hunts or whale hunting in his books and in the press. Many Newfoundlanders are not appreciative of his opinions and have not enjoyed his description of personalities in this particular book and others. The book Bay of Spirits is focused on life in the out ports. Through accounts of boat trips with Claire, his second wife over several summers and a few years in the 1960's he describes the out ports and their residents in quite colourful detail. His descriptive powers are excellent; we can easily imagine the houses perched on rocks. He is a great storyteller and some of us wondered how accurate his stories were, especially some of the sea escapades on his boat Happy Adventure. We wondered how generous he was in comparison to how they were with him. Many of the residents in out ports he visited gave him food and help with his boat. He was quite evidently focused on himself and his causes. Though the book has a subtitle A Love Story, and there is quite a bit about his relationship with Claire that he meets while still married to Frances, the book definitely has a political bent. Awareness of the over fishing and the destruction of the fishery came out in this book as did the baby seal issue and a definite dislike for Premier Joey Smallwood. Most members enjoyed the book mainly because of Mr. Mowat's easy storytelling style. We also talked about books we have enjoyed and about other lists of book. We talked about Yan Martel and the books he has been sending to Prime Minister Harper. There is even a website that describes the books and includes the letters Yan Martel has written to Mr. Harper. Books read in 2007 - Choose your favorite!